Mum created this photo art today using a mix of PicMonkey and BeFunky. She's been really stressed lately and says this is the only thing she could come up with for Caturday Art this week as when she's stressed she can't get motivated enough into doing anything she normally enjoys doing. So, I purred alot on her lap and kept close by for extra kisses and cuddles. The love shared between human and animal is the best cure for any sadness, or at least it makes it more manageable. I'm sure I don't need to tell any of you that. If only people that aren't animal lovers or pet guardians knew that too. Mum has had enough of trying to make them understand. There's a lot of unenlightened ones like that in her life, and she knows they judge her for being 'different' - basically for not being a sheep and following the herd. Actually, she is like a cat - independent and free-spirited and no-one can tell her what to do. Anyway, frankly, she wishes she could keep her distance from people like that. As you can imagine, Christmas is a stressful time for sensitive souls like my mum. The only thing she likes about it is that it's winter and we can be cosy together and hopefully it'll snow a bit. Highly unlikely these days, but maybe it will. You never know with this crazy weather. Also sharing this video again to inject some fun into this post. If you haven't seen it before it's of me playing with Mr Catnip Mousie (remember him?) Mum created a special cartoon filtered version of it for a past Caturday Art post. I thought it would be fun to post it again. Check Out My Store for Some Great Gifts for Cat Lovers! I think your art this week is absolutely adorable. I always love your art but this is one of my all-time favorites. I hope your mom feels better. I feel the same way sometimes with people in my life but I try not to let it bother me. I'd rather be with my cat than them anyways! I guess that's why I feel closer to my online friends...they "get" me. 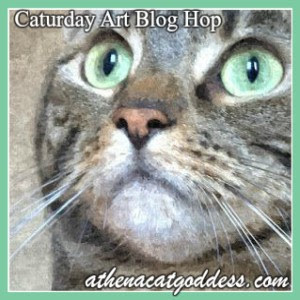 Beautiful art Athena. I am sorry this is a stressful time for your Mum, make sure you give her lots of cuddles and purrs. That's a very cute and festive picture, Athena! I love the cartoonized video too - it looks awesome! Athena! Mes loves them both! Your Mommy is so furry creative. Wes LOVES the work she does! And wes understands stress. Our Mommy sends your Mommy a virtual hug and a cup of tea. Wes is stressed around here too and a little blue. (Cinnamon, Jo Jo and Kozmo will bes going back home this week). I think this is beautiful, Athena! 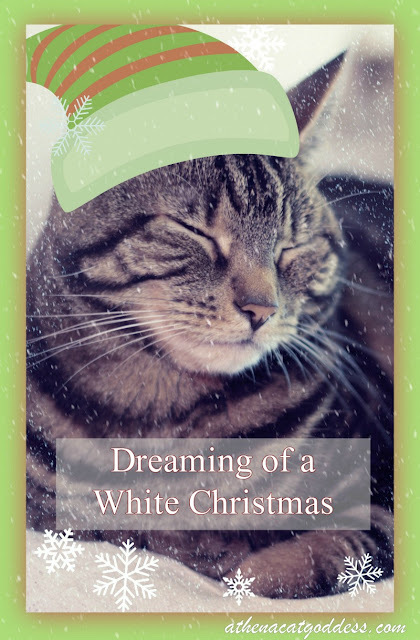 We love winter and Christmastime, and so we think this is just purrfect. And I know exactly what your mom is talking about, Athena, when she says how certain people are sadly so unenlightened these days. You just keep on cuddling and purring for your mom, Athena, and let her know that those peoples' opinions don't matter one bit. All of us here are here for her! Such a beautiful picture, and so wintry! It makes me long for a cup of hot cocoa. I know how your Mum feels, Athena. Sometimes the world is a harsh place for sensitive souls. But please remind her that it's the sensitive souls who bring a lot of love and happiness and beauty to the world. Sending her lots of hugs and purrs! Well, I think your art today is cute. TW gets depressed when the weather gets colder. That's a lovely winter work of art, Athena! You look like you are having pleasant dreams! We are sorry things have been stressful for her. People are oftentimes not very nice to sensitive and loving souls such as your Mum. Please give her lots of snuggles and let her know we understand, okay? We hope your Mom feels better soon. The holidays are often stressful for the humans. Lovely art, Athena. I hope your mom feels better soon! Continue to give her lots of purrs and cuddles. Love the video and effects, too.